Jack Marriott makes it 2-0 for Posh against Bury. Photo: Joe Dent/theposh.com. Peterborough United manager Grant McCann insists matchwinner Danny Lloyd isn’t going anywhere. The Peterborough Telegraph revealed this week Lloyd had spent time on the transfer list as Posh tested the water while they make plans to strengthen their squad in the January transfer window. Danny Lloyd on the ball for Posh against Bury. Photo: Joe Dent/theposh.com. But Lloyd’s two-goal display in today’s (December 23) 3-0 League One home win over Bury, which followed a last-gasp winning goal at Fleetwood last weekend, means he is set to stay at the ABAX Stadium. The 26 year-old now has eight goals to his name in his first season at Posh. Lloyd made a big step up from National North League side Stockport County in the summer. “Danny isn’t going anywhere,” McCann stated, “He’s made a massive step up in terms of standard so to have eight goals already is some going especially as he is not an out-and-out goalscorer. “And there is more to come from him. His first goal today was typical of his ability to get in the scoring positions and his second goal was stunning, but he has that in his locker. I’ve seen him score goals like that in training. Posh pair Chris Forrester (left) and Michael Doughty battle for possession against Bury. Photo: Joe Dent/theposh.com. “Danny is an excellent player and he won’t be leaving us. He’s part of a front three alongside Marcus Maddison and Jack Marriott that is causing teams problems. 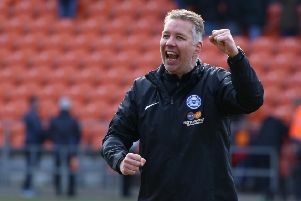 Posh have now won three competitive matches in a row. They are up to seventh in League One and just one point outside the play-off places ahead of tough away games at fifth-placed Bradford City on Boxing Day and MK Dons next Saturday (december 30). McCann accepted Posh didn’t play particularly well against Bury, but he insists winning is all that matters in such a busy period. Top scorer Jack Marriott also scored against the Shakers, his 19th goal of the season in all competitions. “Performance-wise we weren’t great,” McCann admitted. “But any manager will tell you it’s about finding a way to win the games over the festive period. “Even though we scored early on, we weren’t fluent at all in the first-half so I asked the lads to just dig in and make we ground out a result. “Bury are a good team. They are in a false position at the bottom of the table. Eight or nine of the players who started today’s game have played in the Championship and they will improve. “I was disappointed we didn’t kick on after scoring so early. We didn’t take the game to them, we didn’t get close to them and we let them settle and play. “It was a good test for us. People will say it was only Bury who are bottom, but they are the people who also say we can’t beat teams at the bottom. “Marcus Maddison was good again. He can float round at times without doing a lot, but then, bang, he influences the game in a big way, a bit like Steven Gerrad used to do for Liverpool. McCann selected Jermaine Anderson in midfield ahead of Leo Da Silva Lopes, but withdrew him at the break in favour of Chris Forrester. Captain Jack Baldwin wasn’t risked because of a slight hamstring problem, while striker Ricky Miller was ill. But there was a welcome return to the squad for striker Junior Morias who hasn’t played since September because of a thigh injury. Morias is still short of match fitness so may miss out when Posh travel to Bradford. Left-back Andrew Hughes playeed for 90 minutes today despite feeling unewell.